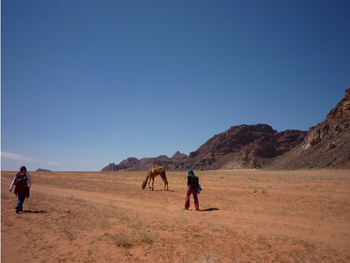 The tour starts from Wadi Rum with a Bedouin hiking guide to the Nabataen Temple. After the Temple you will visit Lawrence Spring and afterwards go to the Khazali Canyon where you can walk inside to see the inscriptions. Here you will have lunch with bedouin tea and you can relax for one hour. After lunch you will continue hiking to the Bedouin Lifestyle Camp where you will stay overnight. From the camp you can watch the beautiful sunset. After breakfast you will start hiking with your guide to Um Frouth Rock Bridge which you can climb as you wish. Feel free to relax as your guide prepares the meal. After lunch you will go to the Little Bridge, before returning to the camp for another beautiful sunset. The next morning after breakfast we will drive you back to Rum Village, or you may hike if you prefer. Another option is to ride a camel back to town for 25 JD for each camel.